An interesting and informative article from our local paper, The Santa Barbara Independent, about the ‘domestication’ of the Great White Shark and the subsequent implications. Four Southern California great white sharks have resided on display at the Monterey Bay Aquarium since 2004 — each in the Outer Bay exhibit for as long as six months before being released back into the wild. Aquarium spokespeople say the display program has benefited public perception of sharks everywhere and, ultimately, will boost interest and activism in preserving the ocean’s diminishing shark populations. 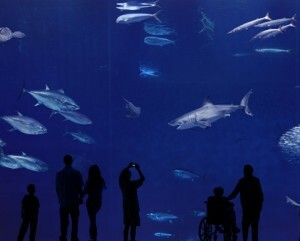 However, five great whites have died in the hands of the Monterey Bay Aquarium since 2004, when the facility began acquiring juveniles entangled in the nets of certain boats and, consequently, critics have suggested that the aquarium is doing less for wild great whites than it is for its own box office sales. Monterey Bay Aquarium spokesperson Ken Peterson claimed the display program “hasn’t been a big income generator,” adding that at least $500,000 of ticket sales revenue in recent years has funded studies of wild great whites, which are regularly captured off the California coast, fitted with transmitters, and surveyed remotely as they range about the eastern Pacific. Moreover, Peterson noted that seeing a live great white eye to eye is an immeasurably powerful experience for aquarium visitors. “By opening tens of thousands of people up to the experience and emotional connection with an animal that has been so vilified for so long, we believe we’re providing a net benefit to the species,” he said. The exhibited great whites have been caught by fishers targeting halibut and white sea bass with nets — and by aquarium biologists with hook and line — in the waters just south of Santa Barbara, often on the productive halibut ground known as the Ventura Flats. Intentionally catching great whites in California has been illegal since 1994, when the California Department of Fish and Game banned recreational and commercial take. However, the state prohibition offers a stipulation: “If landed alive incidentally in set gill nets, drift gill nets, or round-haul nets, [great whites] may only be sold for scientific or live display purposes.” The Monterey Bay Aquarium holds the required paperwork to purchase and retain “incidentally” caught great whites. Commercial fishers who turn over great whites to science receive payment. According to one veteran commercial fisherman in the area, the Monterey Bay Aquarium offers fishers a stipend of $300 for a dead great white and $2,000 for a live specimen. The fisherman guessed he has sold as many as 10 great whites to the aquarium in recent years, including six in 2006. Two of that season’s sharks had died in the net, he says. (Several other area fishers did not return calls for this story.) Ironically, the Monterey Bay Aquarium’s Seafood Watch program advises consumers to avoid halibut caught by gillnetters, citing the fishery as “unsustainable.” Yet the aquarium itself pays these very fishers to hand over a protected species. Sean Van Sommeran, an independent shark researcher and founder of the Pelagic Shark Research Foundation, said he suspects that such a monetary reward system could motivate gillnetters to set their gear in places known to be frequented by juvenile great whites, such as the Ventura Flats, where sharks gather May through September. “If they’re paying these guys for sharks dead or alive, then the way I see it, that’s a commercial fishery for [great] white sharks,” said Van Sommeran, who was among the first Californians to urge the state to ban the killing of great whites in the early 1990s. Many scientists, some involved with the Pelagic Shark Research Foundation, are also involved in studying the species. Archived catch records from the California Department of Fish and Game, which requires that all commercial catch of all species be weighed and reported, show a dramatic increase in annual great white landings beginning in 2004, the year that the aquarium first displayed a live member of the species. Before then, landings were scant. In 1997, 258 pounds of great white were reported, all from the Los Angeles/Santa Barbara area. In 1998, 138 pounds were weighed. None were reported in 1999. The Santa Barbara area produced 149 pounds in 2000, while a fluke catch of a 1,700-pound adult came from Morro Bay. In 2001, 86 pounds — possibly two sharks — were caught in 2001, all from the Santa Barbara area. Records from 2002 and 2003 indicate zero great white landings statewide. But in 2004, the reported landings of “incidentally” caught great whites jumped to 422 pounds. Subsequent annual landings of great whites came in at 410 pounds in 2005, 467 pounds in 2006, and 568 pounds in 2007 — all from local waters, where the juveniles gather in the shallows. In 2008, 18 great whites between 50 and 90 pounds were landed, tagged, and eventually released, according to Dr. Christopher Lowe, a Cal State, Long Beach marine biology professor who regularly handles the sharks entangled in nets. One of 2008’s great whites was shuttled to Monterey to the Outer Bay exhibit in late August, where it resided for 11 days before being returned to the ocean after its health deteriorated. In spite of the dramatic increase in landings, area fisherman Ben Henke says he and other fishers never string their nets with the intent of catching great whites. “It’s pretty hard to target these fish,” he said. “They’re all incidentals. You probably couldn’t target one any better than if you just waited for one to come along.” Yet Henke and several other fishers catch great whites so reliably that, with the financial assistance of aquarium affiliates, they have installed live holding tanks on their vessels. The seawater-fed tanks can be used to contain live halibut, but the fisherman said the feature was installed on his boat largely for sharks. The Monterey Bay Aquarium has also developed its own infrastructure for great whites. In 2002, it anchored a floating holding pen off of Point Dume, near Malibu, to contain netted sharks for study before deciding whether to send the fish to the Monterey Bay Aquarium or to tag and release them. The pen has been anchored there each summer since. A “rapid response team” of researchers with the Southern California Marine Institute and Cal State Long Beach — including Lowe — even stands by, waiting on the next call from a fisherman with an accidentally caught great white in his net. Peterson, the aquarium spokesperson, concedes that fishers are paid for their great white-related services, but not enough to motivate anyone to intentionally wreck their nets with a live specimen. “We do compensate [the fishermen] for time lost fishing, but we’re really careful in communicating to them that there’s not some bounty out there for bringing in a [great] white shark,” Peterson explained. John Ugoretz, a Department of Fish and Game biologist who reviews collection permit applications from scientific institutions, sees no reason to believe the Monterey Bay Aquarium is abusing its privilege. “We’re very keen on making sure that this isn’t just a display adventure for them and that they’re actually collecting valid information and knowledge,” he said. Lowe and Peterson report that the information generated by the tagging program has been monumental. Of 39 sharks handled by the aquarium since its program began, most have been quickly put back in the water wearing transmitters, Peterson said. Some of these sharks were tracked on surprisingly extensive forays as far as the Sea of Cortez and outward toward Hawai‘i. Understanding the animals’ range of migration could help researchers improve their understanding of great white populations and help governments better manage and protect the fish. In addition to the five sharks that have died in the hands of aquarium staff since 2004, the rapid response team has also acquired a total of nine dead great whites from the fishers, Lowe said, bringing what could be called the program’s “death toll” to 14 great whites. Yet Peterson claimed the sharks displayed in the Outer Bay tank have served as effective ambassadors for their entire species — something this maligned predator has rarely had before. “This is making an emotional impact between visitors and an animal that’s otherwise been demonized, and that gives us the opportunity to talk about the conservation of not just [great] white sharks but all sharks around the world,” said Peterson, who also noted that the aquarium will likely put another great white on display in summer 2009. Other researchers have noted that — in spite of public enthusiasm for sharks, shark movies, and shark exhibits — the slaughter of wild sharks for fins, flesh, and wall mounts remains rampant. In the 1980s, after an undercover filmmaker took footage of commercial tuna fishers massacring hundreds of dolphins, the world reacted with outrage and activism. However, abundant primetime footage of fishers slicing the fins from live sharks before discarding the crippled fish back into the sea has not quite had the same effect. Wild sharks are 90 percent gone, say scientists, and still diners eat them in restaurants. Lowe believes the dramatically increased catch of juveniles since 2004 is not a sign of illegal fishing maneuvers but rather a reflection of a growing great white shark population. Still, neither he nor other researchers can estimate the size of this migratory fish’s population, and worldwide great white populations are generally assumed to be reduced from their natural levels — perhaps still shrinking. But Lowe believes the climate may be improving for great whites and their future growing brighter. Whether sharks in a tank have anything to do with such a turnaround remains a question unanswered.